I think is one of the best books fiction books that I have read in a very long time. It has taken me quite a while to read it in its entirety, but I finally read it from cover to cover, last month. I thought that it was going to take me a very long time because it has more than 400 pages. However, it only took me about a week to read it. Perhaps it’s because I was so engrossed in the story. It is a story about the world’s rejection of a woman, but the love that God has for her and shows her through others. Rejection is the overreaching theme of this book. Our main character, Sarah, is rejected in so many ways, that it will literally bring tears to your eyes. If you have ever experienced any amount of rejection in your own life, this book will bring it to the surface. 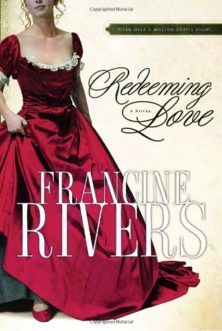 What I am most thankful for is the fact that Francine Rivers made sure, in her writing, that she did not just leave her reader with the feelings of rejection. Instead, she brings us full circle with the understanding…she literally shows us God’s love. As I was reading this book, I was amazed by the story. I was talking to someone about the book and was told that the book was just “fiction.” While I know that the book is fiction, I also know that this could happen. The feelings that were experienced by the characters were feelings that people feel everyday. In some of the situations, I have even felt those feelings myself. If there were not a need for people to be reminded of the love and acceptance that God has for them, He would not remind us of it continually, in the Bible. Hence, as this story comes alive, we are healed with the words of the writer, inspired by the Holy Spirit. I want to make sure that I don’t give any spoilers, so I’m not going to go into the plot of the story. However, I will say that I would recommend anyone that is looking for a good read to pick it up. I would encourage those that are dealing with relational issues, to read this book I would suggest anyone that is dealing marital issues, rejection issues, or self-rejection to pick it up and read it. I would give a warning though. Although this book is not explicit in nature, it is not for the young reader. It deals with adult topics and matters of intimacy on various levels. Your will not be exposed to erotica, as it is a clean book. However, I would not allow my 7-year-old to read it due to the adult nature of some of the rejection issues. It would be good for some teens, if their parents have already had talked with them about intimacy and other adult issues. Still, I am so thankful that God allowed Francine Rivers to write this book and He placed it in my hands. I had attempted to read this book before, but I realize now, that it was not time for me to read it. I needed to read it this year. I had endured so many different situations, heart breaks, and rejections over the past few years that God used this book and His Word to speak to my heart. We all need a good read like that! I hope that you will take the time to read this book at some point in your lifetime. It is definitely worth the read. California’s gold country, 1850. A time when men sold their souls for a bag of gold and women sold their bodies for a place to sleep. Angel expects nothing from men but betrayal. Sold into prostitution as a child, she survives by keeping her hatred alive. And what she hates most are the men who use her, leaving her empty and dead inside.